Home » Blog » Otter – too close? Otter! 5 minutes from the end of the walk we heard a splash and saw otter tail sticking out of the water. The otter surfaced with a small fish twisting its body in the water as it ate. Having spotted us it retreated to a bush on the waters edge and peered through a gap to check what we were up to. I took a few shots but it was difficult to focus with the brambles and branches. We then left it in peace. 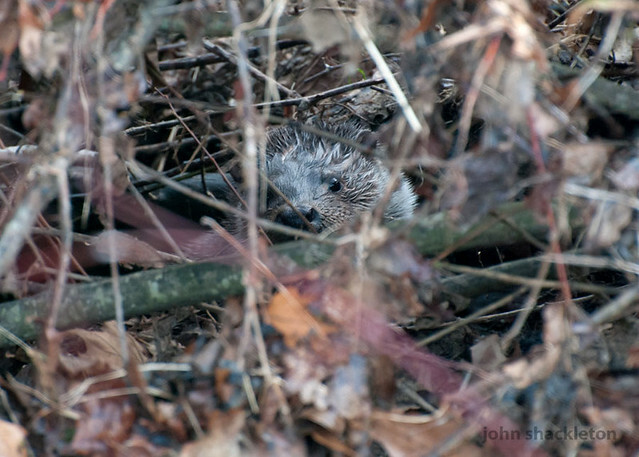 Some people have commented the photo looks like a large hedgehog in a bush!